I remember reading something somewhere about how some K-4's were equipped with MG151/15's, but when I tried to find the article again, I could not(not off wikipedia, some random self-made fan webpage). I don't know how many, just that it was plural. Is there any truth behind this? I really can't see why this would ever happen, but I feel like it would be something interesting to have as an option if it were true! inb4 one shots everything like the 13mms. 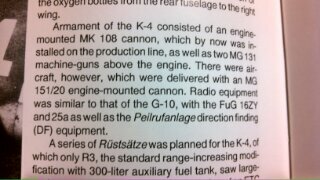 If you scroll down to the K-4, it states that there were 15mm cannons "semi-recessed above the engine". Obviously, we shouldn't be taking everything on the webpage for granted, especially since I don't see any sources listed. Hence, I'm asking here. Out of all my books I have on the 109 series it doesn't state the K4 could mount the MG151/15's. But my books did claim that the K4 could mount a MG151/20 in it's engine compartment instead the MK108. I want the 20mm as an option instead of the 30mm for sure because that Mk.108 is pretty hard to aim in a serious dogfight in my opinion. And before anyone else jumps on me like "n0000000000b get gud at aimingz", I can aim very well with every other gun in-game. I actually remember reading that in some aircraft mag years ago(Mg 151/15 in engine cowling), it stuck to my mind. Don't know if it's true though, maybe they tried fitting them on a few K-4 or something. I don't think they'd ever put 151/15s as cowl guns, that wouldn't roll when they built the K-line with standardization in mind. The 131s weren't bad weapons IRL, it's just in WT where they're trash. I want the 20mm as an option instead of the 30mm for sure because that Mk.108 is pretty hard to aim in a serious dogfight in my opinion. This please. I would still probably opt for the 30mm, but it would be nice to have 20mm as a option considering it was historical. Personally i think putting gunpods on a K4 is for suckas, so please don't just tell me to add them if i want 20mms. Interests:Why are you looking here? there is just one late war fighter who armed the 15mm (i think) and that was the Ta 152C3..
they even made special tungsten core shells for it. Interests:Games, school, computer, soccer, Polos, discussion, debates. Hmm, was MG151/15 that small to fit into the same place instead of the 13mm? let alone the ammo space needed. I never heard of MG151/15 taking the place of the MG131s, if so everyone would take them over the MG131 laser pointer. We should get MG151/15 for engine mount in F4 though. I am against that, knowing Gaijin the 151/15 will be the standard weapon first. It is also slightly annoying that you can not switch engine mounted weapons in a round. Hopefully, since the MG151/15 is better in WT. Well first game with F4 means atleast 2 kills which in conjunction with Win of the Day gives like 3 upgrades at once... it will be fine. Besides with 15mm it should be more nimble and F4 with 15mm nosemounted was considered perfect Messerschmitt back in the day. Don't make such sad eyes, F4 should be lower in BR and it propably will get there some day. So re-arming and refueling a plane in 10 seconds isn't enough? You want the poor ground crew to be able to practically disassemble the entire front end of the aircraft and replace the hub mounted gun in the same time frame? Man, I guess changing 4 tires and making adjustments on an F1 car in 2.7 seconds isn't enough either? Those lazy mechanics should be able to do an engine swap at the same time too? I don't care if they give the F4 a MG 151/15, how about they just fix the dang MG 151/20 already. Its literally the heart and soul of most German fighters and we're sitting around talking about "fixing" one tier 3 BF 109 instead of fixing the gun that is featured on practically all tier 3 and 4 German fighters. If the MG 151/15 is actually stronger right now then we should promote whatever we need to to get the MG 151/20 work better then it. Interests:WWII Aircraft! Especially those of the Luftwaffe. rock music, history, and R/C Warbirds. The 15 has been terrible for me.